Developer Social Point is known for its pet-breeding games like Monster Legends and Dragon city. But this time, it has got something different for players. Instead of the usual breeding game, developers have created a game like Mario, and trust me, this game has full of amazing 3D levels that breathe life into the platformer genre. Dragon Land features your favorite fire-breathing creatures from Dragon City, but instead of flocking around their base, they will be climbing walls, jumping over obstacles, gliding on air and hitting the bad guys. Each creature has a special ability which can help you overcome obstacles and complete levels. Every dragon has a special skill. Blaze can glide whereas Rocky can climb walls. Blizzy can stomp and Ice Cube flap-flaps to go from one place to another. While playing, you can switch to a different dragon if the environment demands so. For example, in one level, I had to switch to Blaze because the level had an area where I had to move from one platform to the other and only gliding could have made it possible for me to move. Keep an eye on signboards. They show how to overcome obstacles and many times a signboard will be placed near an area telling you that obstacles in this area can be cleared using a dragon’s special skill. You may have noticed such signboards just beside huge walls. Such signboards tell you to use Ricky’s wall climbing ability. 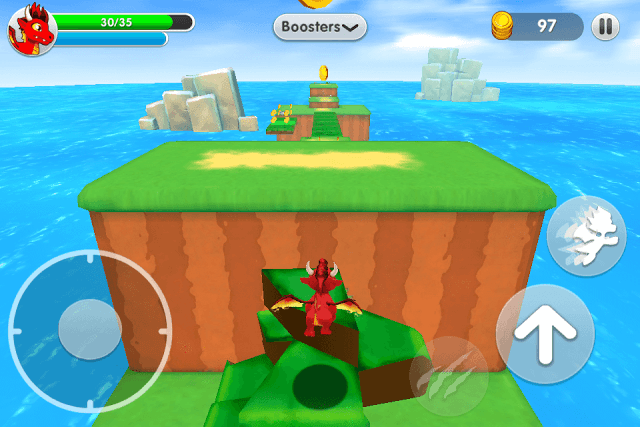 However, some levels are dragon-exclusive and you won’t be able to choose another dragon when starting a level or switch to a different creature in the middle of a level. You can easily identify such levels before playing them, just tap on a level in the map and if there’s no “Change Dragon” button, then that level won’t let you change a dragon or switch to another fire-breathing creature while playing. In 3D levels, it might be difficult to hit a block or bounce off an enemy. But thanks to your dragon’s and block’s shadows, you can easily see their positions. When you press the jump button to bounce off of a creature, you will be able see your dragon’s shadow. This will give you a clear idea of your dragon’s position. Its shadow will indicate whether you are right on target or it’s a miss. Similarly, you can also see the shadow of a block floating mid-air. The block’s shadow will show its exact position, and you can hit it by moving your dragon in between the block and its shadow. When you jump to hit blocks floating in midair, you get coins. But not all blocks contain coins. Some also contain boosters like Attack, Shield, Turbo, Invincibility etc. The most common booster that you would easily get is “Attack”. It activates your dragon’s secondary skill. Boosters are not always hidden inside boxes. Many can be seen scattered around a level, floating in mid-air. Such booster blocks have a unique color and usually have a golden border around them. You would normally spend gems to get boosters. Since gems are difficult to earn, you can try hitting every box you see to get boosters. And because campaign levels are not time based, you can take your time searching for blocks and hitting them for rewards. Any booster that you receive from blocks is restricted to that level and won’t be carried over to the next level. So try to use them on enemy creatures to earn coins from them. Protects your dragon against enemies and harmful obstacles. The shield goes away when the dragon hits an obstacle or an enemy. Makes your dragon invincible against any obstacles or enemy for a short period of time. Activates attack. Once activated, you can tap on the attack button to destroy creatures. When a dragon climbs a wall or glides, it requires some energy. The blue bar below the dragon’s health bar shows how much energy is left. Keep pressing the special skill button and the blue bar decreases until it becomes empty. It takes time to refill the blue energy time, but with Tireless, the blue bar does not decrease at all. Increases dragon speed for a few seconds. If you want a booster before playing a level, go to Shop and press the Boosters tab. You will need gems to purchase them. You can activate a booster by tapping on the button at the top of the screen and then tapping the purchased booster. After completing a level, the game shows a list of rewards earned. The list shows gems and coins as well as XP earned in that level. The experience gained fills the level or XP meter and once it is full, your dragon gets upgraded to a new level. You can, however, speed up upgrades using coins. To do this, go to “Upgrade” and tap on the blue upgrade button. There will be a tiny exclamation mark on it showing that the dragon can be leveled up. Upgrading your dragon increases its health points and damage points. The damage points are used on a dragon’s secondary skills. For example: Blaze’s damage points can boost its Flamethrower skills. Try to upgrade a dragon when it fails to meet level requirements. The game will warn you and will take you to the upgrade screen when your dragon doesn’t meet requirements. Each dragon also has a max level. Keep upgrading a dragon and when it reaches its max level, it can be evolved into a bigger, more powerful dragon. However, evolution costs pink gems, which are hard to earn. Use them wisely. Spend 250 gems to get this premium dragon. Level 15 dragon. Possesses Glide and Lightening Bolt skills. Does 31 Damage and has 130 Health. Spend only 1 gem to get this adorable dragon. Level 3 dragon. Has Glide and Sword Thrust skills. Does 8 Damage and has 40 health. This Premium dragon can be purchased for 500 gems. Level 18 dragon. Shoots Bouncing Fireballs and can climb like Rocky. Has 145 health and does 35 damage to enemies. Complete all levels in Episode 3 to unlock this dragon. Level 13 dragon. Has Dash and Twister skills (Can take the form of a tornado, destroying any enemies close by). Damage 23 and Health 90. Unlock this Premium Dragon with 750 gems. Dash and Cannonball skills. Level 20 dragon. Health 155 and Damage 38. Complete all levels in Episode 5 to Unlock Blizzy. Level 22 dragon. Has Stomp and Blizzard Breath skills. Damage 36 and Health 135. Spend 1000 gems to get this premium dragon. Launches a vortex and has the Stomp skill. Health 180 and Damage 46. This cute dragon can be unlocked after completing all levels of Episode 7. Has Wing Flapping and Freeze skills. Health 185 and Damage 51. If you are in desperate need of coins, play Quests. You can find quests on an episode map. Tap on the ship filled with gold coins or the quest button at the bottom of the screen to access the quest screen. You can earn up to 325 coins for completing a quest plus extra coins that you collect while playing. There are three different types of quests – 1. Racing 2. A plain 2D level and 3. A level that tests your dragon’s primary skill (Climbing, Gliding etc.). You spend one life for each quest you play. A quest won’t be available soon after completing it. You may have to wait for an hour or so. With gems, you can evolve creatures and purchase boosters. To earn gems, you can try “Quick Play”. One advantage of playing Quick Play is that you don’t have to spend a heart to play it. However, Quick Play levels are harder than campaign levels and you will have to reach a coin target to earn gems. You will get one point for each coin collected. Keep bumping off of enemies and collect coins scattered around a level. Every time you start Quick Play, you will be greeted with a new level and a new dragon. Look out for red gift-wrapped blocks in Dragon Land. They usually contain keys. Keys unlock bonus levels in an episode. Look for golden and silver keyholes on the episode map and tap on them to check requirements. You may have to replay a previous level if you can’t find such boxes at first attempt. Replaying a level will cost a heart. Since most levels are not time based, go slow with your jumps and moves. Examine enemy movement patterns and move accordingly. Switch to another dragon (if the game allows you to do so) when you have realized that it won’t be easy to move from one platform to another with the current chosen dragon. If you are out of hearts, you can watch a video or send heart requests to your Facebook friends. You will need to connect to FB first before requesting lives. The final boss level requires big red crystals, so make sure you collect them whenever you spot them. They will usually be available at hard-to-reach areas or in special rooms, which can be accessed through portals. Look out for vortexes in every level. They will teleport you to a bonus room where you may find those big red gems.